In today’s media world, new events have a shelf life of several days, at best, and a couple of Tweets, at worst. 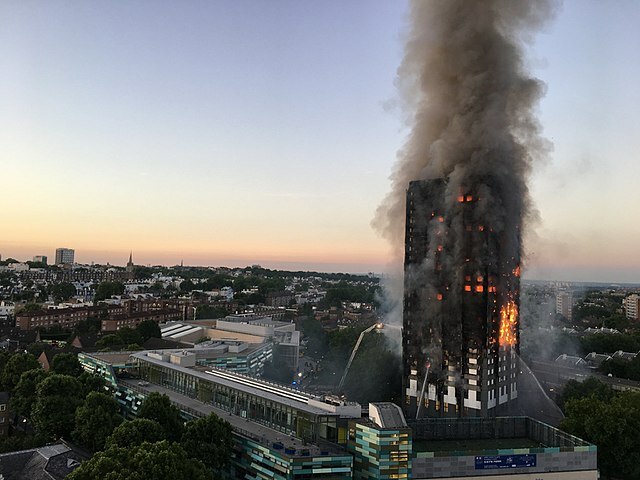 But the charcoaled skeleton of the Grenfell council block continues to tower over the borough of Kensington and Chelsea, black, destroyed and traumatised, making it an inescapable reminder to survivors, residents and volunteers that their government has failed to aid them in the most desperate of incidents. Over the past few weeks, dozens of funeral notifications circulated in the area and on Facebook. The survivors of the fire have hardly been given the privilege of mourning for their lost families, and the sudden displacement of their community. Last week alone saw the burial of 22 children, women and men; some for entire family members or households. “The number of children who have died makes these losses especially bitter. These were the next generation of the community, people at the beginning of their lives who had everything to live for.” Said Yvette Williams of the Justice 4 Grenfell campaign. As scaffolding began engulfing the tower last week, floor by floor white sheeting is being put in place to cover the distressing sight of its remains. Yet Grenfell survivors are worried this will be the first in many steps to whitewash not only the accountability of both the borough council of Kensington and Chelsea and the Tenant Management Organisation (TMO), but the legal implications of such criminal negligence. A recovery security committee has recently been founded to give a platform for the voices of Grenfell survivors. But how can a community affected by such an incident begin to reform itself, heal from the unimaginably futile loss of lives? To lose a generation of young members of a community engraves a hereditary trauma that will leak into decades to come. Amidst the lack of liability, the unknown number of lives lost due to the severity of the fire in conjunction with the deaths of several undocumented residents; the silent march that took place just last Saturday and the lost voices of those who died; it’s crucial to maintain the link between the committee and public safety at high priority, and to continue empowering citizens to keep corporations and councils accountable. We have extraordinary times in Burundi that call for a change in modus operandi if the world wants to avoid a genocide. The Catalan crisis underpins the fragility of Spain’s Transition.